Flat White Gold stud Earrings with a sparkling centre of 19 round Cubic Zirconia’s. 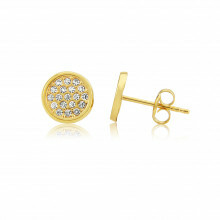 A cute and inexpensive way to get some sparkle into your outfit. Also available in Yellow or Rose Gold.